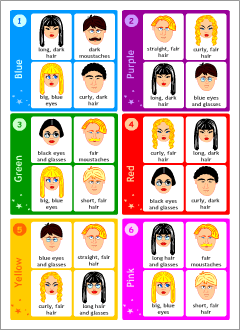 This is a board game with cards for 2 players (or teams) to learn and practise English vocabulary used to describe people. 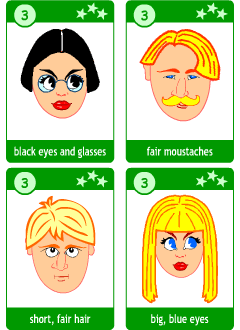 Player Q has to guess the secret set by asking yes/no questions, for example, Has he got fair moustaches? According to the given answers, Player Q eliminates the pictures on his/her game board until he or she finds out the secret set. The partner must guess which set has been chosen by asking Has he/she got...? and working out by elimination which set it must be.